Cotton futures on Zhengzhou Commodity Market have touched the level of 12,390yuan/mt on Apr 19 and kept range-bound then. In the fundamental, the disparity between futures market and spot market was too large previously at around 1,800yuan/mt when futures were around 10,000yuan/mt. With the continual upswing of spot cotton prices, the increase of futures market was quite smooth. Spot cotton prices have been constantly increasing recently, to some extent pushed up by the futures market. In the fundamental, the bullish factors are disappearing gradually, and slowly turning to the bearish factors. Firstly, viewed from spinning mills, when cotton type 3128B prices were around 11,800yuan/mt, production profit of C32S and C40S reached 300-500yuan/mt, with the increase of cotton prices, however, profits were squeezed. If the cotton prices keep up, losses may see again. Secondly, in terms of the link between cotton and spinning mills, cotton inventory in cotton yarn mills did not increase much after prices increased. Mills purchased on need-to-baisis and awaited the state cotton reserves sales in May. Currently, spinning mills operated well. Operation rate of spinning mills increased, and cotton yarn inventory decreased. 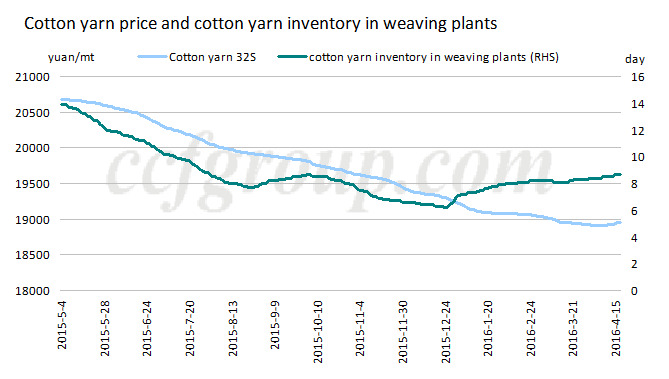 But in weaving plants, cotton yarn prices were dull to climb up and cotton yarn inventory rose. Grey fabric inventory kept down, but this was attributed to the weakness of grey fabric prices and tight capital, which led to the weavers unwilling to do inventory. In general, the increase of upstream cotton market met large resistance in weaving plants, which meant that the continual increase of cotton prices lacked supporting factors from the fundamental. In terms of cotton market, with the gradual consumption, proportion of cotton from Xinjiang Production Construction Corps (XPCC) became larger. Actually, recently, XPCC was active to sell. XPCC hopes to sell cotton inventory before the state reserves sales. Viewed from the fundamental, with the increase of cotton prices, the supporting factors on futures market are less. And the influence of capital cannot be ignored. The futures market is likely to step up further looking from the capital and technical analysis and this round of upswing is mainly pushed up by the capital.